I came home on Monday night simply unwilling to cook. Yep, I’m that lazy and unmotivated. Mark suggested Tu Casa, and while I adore that place, I wasn’t ready for our 450th visit to be achieved that night. Since he had his heart set on Latin American food I knew I had to come up with a like alternative, so I went out on a limb and suggested Taco Escobarr. I must say I’m not the biggest fan of NOSH, so I wasn’t expecting much from this sister establishment. I figured it would probably walk the line between bad Americanized tacos with yellow cheese and a bacon-dusted nightmare. We arrived at 6 in the evening, just in time to miss happy hour. I felt that was an incredibly bad omen, but sat down anyway. There was a table open in the window so that made the bleak evening seem a little brighter because I love to people watch while I eat. Once seated, a very friendly waitress came right over to take our drink order, and since I missed happy hour I ordered plain tap water. Mark followed suit. I learned just what a cheapskate I can be when I miss happy hour by one minute. The menu was small but adequate. Since I hadn’t eaten there before I was confused by the several different offerings of taco shells/accompaniments. I asked the waitress to explain, which she did and I felt it steered me in the right direction a little bit. I went for the Puffy Taco, filled with lettuce, tomato, and cilantro. I ordered three different fillings to try out what they had to offer—picadillo, ancho chile pork, and chipotle chicken. I also ordered a side of Mexican crema, green hot salsa, and had them throw some cheese on top. I love cholesterol, what can I say? When my meal arrived, it was sans cheese and sans crema. I wasn’t really happy with this, but our waitress was great and she went right back to the kitchen and fixed the issue. When it returned mere moments later it looked perfect! The Puffy Shell was rather tasty and held up quite well with the fillings. It reminded me of a hand-held taco salad. It wasn’t greasy, just light and airy, but it was lacking in flavor a bit. Luckily the fillings made up for that. The pork and chicken fillings were by far my favorite. The picadillo had a bit too much cinnamon in it for my liking and I really didn’t think the beef was that good. I also was upset that what was presented to be Mexican crema was nothing more than regular old sour cream. I think they need to update their menu if they aren’t going to be delving out the real deal. Mark decided to order the crispy corn taco filled with onion, cilantro, and queso. He went for the crema on the side and three different fillings as well—carne asada (again with the beef), chipotle chicken, and ancho chile pork. His were pan-fried crispy and reminiscent of a mini-quesadilla. The cheese was melted and deliciously gooey. They were piping hot and very tasty. He won the taste off because I definitely preferred his choice of shell over mine. He said that he felt the carne asada was the best filling, but I really loved the ancho chile pork in the crispy corn shell. Overall, I think that Taco Escobarr is doing a lot of things right. They have a small menu and they are mastering that. It’s also fairly inexpensive, we only spent $16. For Americanized versions of tacos they were really well done and I wouldn’t hesitate to eat here again or recommend it to others. If you are looking for a cheap and quick sit down dinner I think this is a great option in Portland, I just beg them to get real crema. Nothing says the weekend like margaritas and a Girls’ Night Out. Friday night I stepped out with some very lovely ladies to eat, drink, and (salsa) dance the Portland night away. We started our evening at El Rayo Taqueria. I had eaten there once with Mark over a year ago and we hadn’t been overly impressed. My friend Bitzy is a fiend for their fish burrito and begged me to reconsider trying the restaurant again because a) she didn’t think I gave it a fair shot and b) she obviously had an intense fish burrito craving. I decided it was time that I gave it another shot. After all, maybe I just had a bad meal there. We strolled in at seven o’clock, and literally walked in at the perfect time. The place erupted with business about 5 minutes later. We only had to wait about 15 minutes amongst the intensely bright and overdone (and also somewhat cheesy) décor. It was just long enough for everyone to get a drink. Bitzy and Laura love tequila so it was all Margaritaville for them. Alicia decided on the Rosa Limonada, a vodka drink, since she isn’t a tequila girl. I, being a lover of all things mojito, decided to give El Rayo’s version a test drive. It was very well done— quite strong with just the right amount of mint. The only complaint I have is the price. For $8.95 it could have been about two or three times the size. I switched to beer after I finished it for fear of going broke. 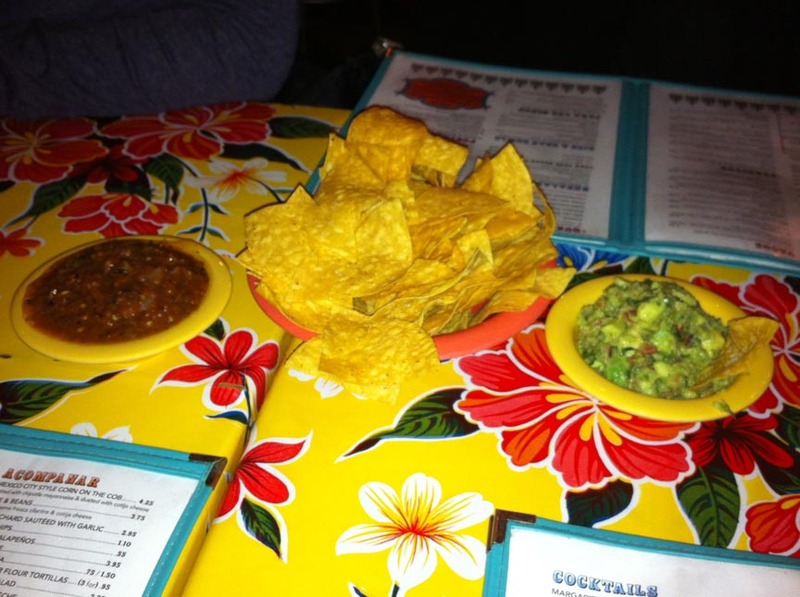 We sat down and ordered some chips, salsa, and guacamole as an appetizer for the table. Everyone agreed that the guacamole was great, though nothing like “authentic” versions I have had in other Mexican restaurants. It was not creamy and there was a lot of cilantro. I like it when guacamole can stand more freely without all of the extras, so overall, while this was good, it wasn’t great in my opinion. The salsa, however, was stellar. I could tell it was made in-house and I appreciated the fresh taste and slight “kick” that it provided. When it was time to order Bitzy went straight for her Yucatan burrito. It has fried fish (haddock perhaps? ), coleslaw, avocado, rice and chipotle mayo. She said she’s has better versions of the same on other occasions, but overall I could tell she was overjoyed to be eating it. I tasted it as well, and it was delicious. 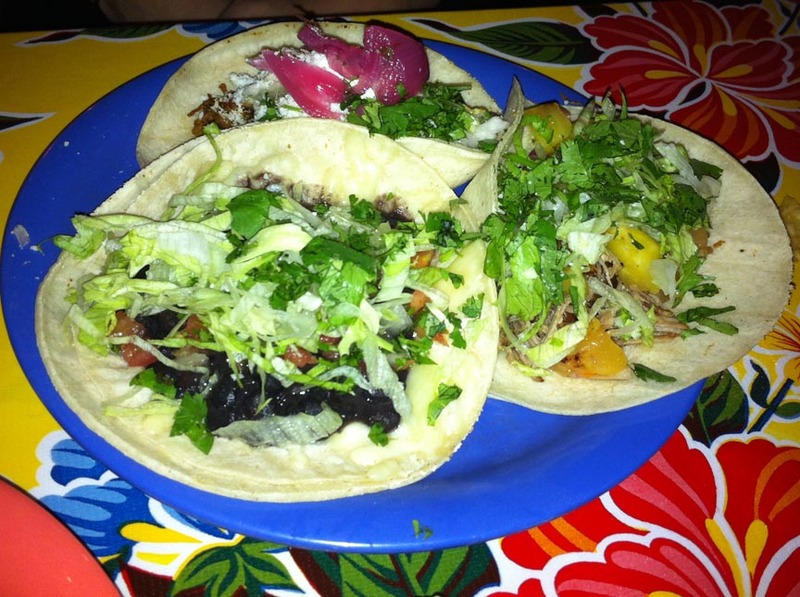 Laura had never tried the tacos there so she ordered three different varieties to see what they might be about. Since she usually orders a burrito when she goes, she felt change might be a good thing. She ordered one frijoles (black beans, cheese, pico and lettuce), an Al Pastor (slow braised pork with pineapple salsa and shredded lettuce) and a pulled pork (topped with cotija cheese and lettuce). The frijole and pulled pork tacos were her favorite. She said the Al Pastor was very dry and lacking flavor. I must say though, from the looks of the tacos El Rayo is on the right track. They doubled up on the tortillas to avoid soggy breaking (everyone hates that, right?) and the accompaniments were minimal. After all, tacos are meant to be simple Mexican street food. I think next time she goes back she’ll be back on the burrito bandwagon. 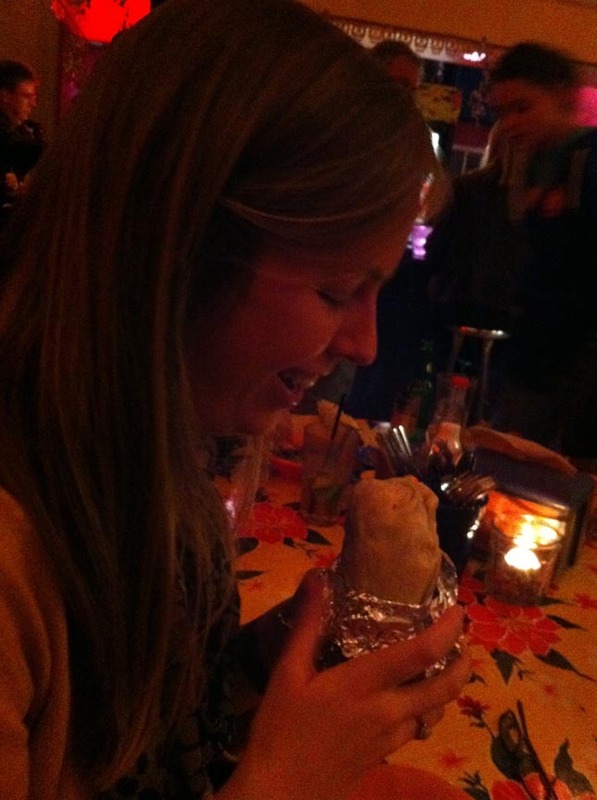 Alicia decided to get the Carnitas burrito with pulled pork, caramelized onions and a ranchero sauce. She was happy with her choice, and though I didn’t try it, it looked absolutely delicious. I would probably give it a try if I go back another time. I decided to order the enchiladas that were on the specials menu for that evening. 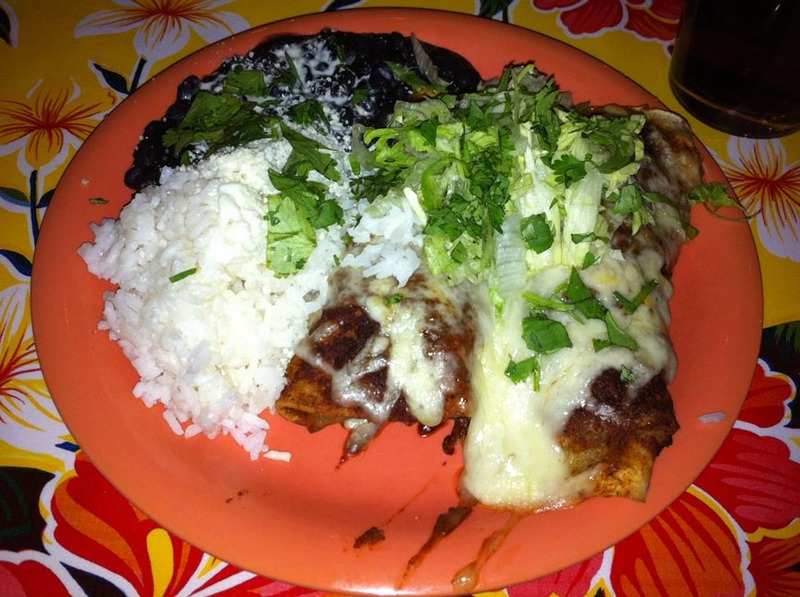 Pork enchiladas with cheese and onions covered in with red sauce served with black beans and rice on the side. The pork in it was excellent—tender and flavorful. The red enchilada sauce left a lot to be desired though. It was practically non-existent and what little was put on top had already soaked into the tortilla. I was definitely disappointed. All in all, it was a good start to a fun night. While not my favorite place to get burritos, tacos or enchiladas in Portland I don’t think that it’s terrible. I can’t put my finger on exactly what is lacking there for me, but if a friend wanted to go have a causal dinner there again, I would certainly go. I would not, however, get the enchiladas ever again. The quality of the pork was good, so it gives me hope if I decide to go back sometime and try a pork dish another time around. I just don’t think I’ll be knocking down their door anytime soon though. I apologize profusely to Bitzy and other El Rayo frequenters, but it’s just not my jar of salsa kids.